Langkawi may hide behind its popular beach resorts, tax-free haven and party scene but there’s miles of stunning, unspoiled jungle and rainforest to explore, making it one of the most accessible ecotourism destinations in the world. In 2007, UNESCO listed Langkawi as a geopark, guaranteeing the conservation of many uninhabited parts. Ever since, this archipelago has thrived on ecotourism with thousands of visitors wowed by its natural beauty. Langkawi is the perfect destination to spot the most diverse creatures. The Mangrove Swamp Tour is one of the most popular activities on the island and a must for all nature lovers. Mangrove forests are home to a whole ecosystem of rich flora and fauna. The most common species of monkey on Langkawi is the macaque. Be careful, though! Beneath their adorable appearance they can be quite aggressive; hissing, spitting and trying to steal your food. Comparatively, dusky leaf monkeys are shy and more difficult to spot. You can recognise them for their white circles around their eyes and the colour of their newborn (yellow). The mangroves are also common place for squirrels, sea otters and many reptiles including snakes, crocodiles and mudskippers. Langkawi is home to over 240 bird species. The most impressive and easiest to find are the eagles. Did you know Langkawi actually means reddish-brown eagle in the local language? The main place for feeding eagles is the Kilim River, north-east of the island. You can admire these creatures from the comfort of a boat tour along the river or while island hopping. Langkawi is also home to more than 500 types of butterfly. Take a Butterfly Discovery Tour and see how many you can spot? Local guides will also talk about the flying five: flying snakes, squirrels, lemurs, foxes and even monkeys. See and believe for yourself. Langkawi is not only rich in fauna but also geological diverse. Gunung Mat Cincang is probably Langkawi’s best-known mountain, aside from its neighbour Gunung Raya. At 850m high, it is the second highest mountain in Langkawi and is the oldest rock formation in Southeast Asia. If you have experience, you can hike to the peak with a refreshing stop at the Seven Wells Waterfall. If not, it’s advisable to take a guided tour to climb the mountain or maybe catch the famous Langkawi Cable Car. The views are stunning! Langkawi’s limestone formations are also a popular visit on the island. The limestone hills are home to well-known caves like Gua Kelawar and Gua Cerita — home to ancient legends and mysterious inscriptions in Jawi language. For a half-day or day tour, hop on a speed boat and cruise around Langkawi’s amazing islands and beaches. 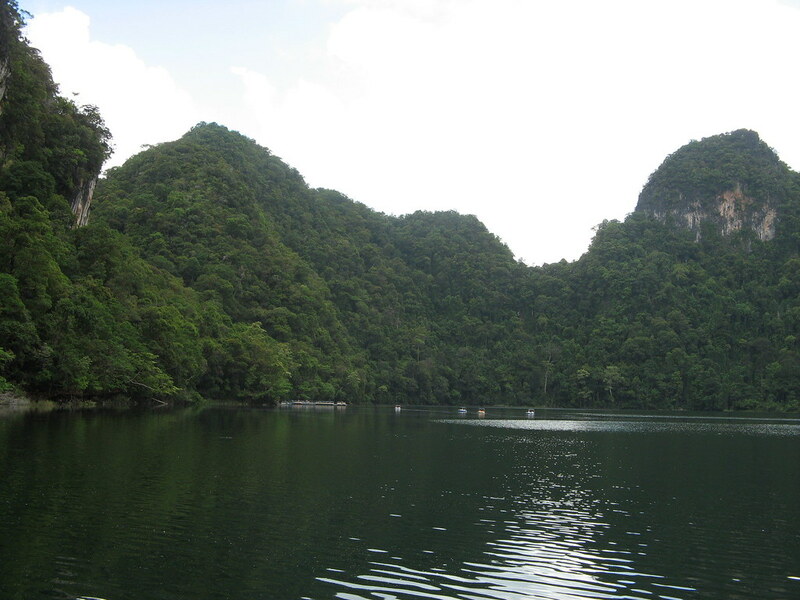 The second biggest island on the archipelago is Dayang Bunting, literally meaning pregnant maiden. The island has a fresh water lake surrounded by mystery and superstition. The legend says Prince Mat Teja fell in love with the celestial Princess Mambang Sari, who liked to bathe here. They got married and had a son, who sadly died. They left their son in the water to rest in peace. Since then, there is a strong belief among locals that barren women will be able to conceive after taking a dip in the lake. Pulau Payar Marine Park is the best diving destination on the west coast of Malaysia. This uninhabited area consisting of four little islands is 30km from the coast of Langkawi. To get there you have to book a return boat journey. There is no accommodation on the island. Apart from the diverse marine life, Pulau Payar is a good place for wreck diving due to numerous capsized fishing boats which have created artificial reefs here. For more information about the Langkawi UNESCO Global Geopark head to https://www.langkawigeopark.com.my/en/. Also visit http://naturallylangkawi.my/ for events, news and deals.